Significant PGE and Cr mineralization occurs in a number of 2.44–2.50-Ga mafic layered intrusions located across the Karelian and Kola cratons. The intrusions have been interpreted to be related to mantle plume activity. Most of the intrusions have negative εNd values of about −1 to −2 and slightly radiogenic initial Sr isotope compositions of about 0.702 to 0.703. One potential explanation is crustal contamination of a magma derived from a mantle plume, but another possibility is that the magma was derived from metasomatized sub-continental lithospheric mantle. Samples from the upper chromitite layers of the Kemi intrusion and most samples from the previously studied Koitelainen and Akanvaara intrusions have supra-chondritic γOs values indicating some crustal contamination, which may have contributed to the formation of chromitites in these intrusions. Chromite separates from the main ore zone of the Kemi and Monchepluton intrusions show nearly chondritic γOs, similar to the coeval Vetreny belt komatiites. 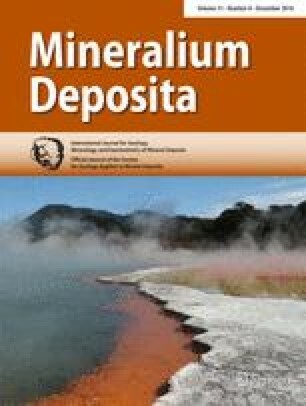 We suggest that the Os isotope composition of the primitive magma was not significantly changed by crustal contamination due to a high Os content of the magma and a low Os content of the contaminant. Modeling suggests that the Os and Nd isotope compositions of the Monchepluton and Kemi intrusions cannot be explained by assuming a magma source in the sub-continental lithospheric mantle with sub-chondritic γOs. A better match for the isotope data would be a plume mantle source with chondritic Re/Os and Os isotope composition, followed by crustal contamination. The online version of this article (doi: 10.1007/s00126-016-0673-9) contains supplementary material, which is available to authorized users. Liming Zhou, Andao Du, Fagang Zeng, and Li Li are thanked for Re-Os isotope analysis. Laboratory assistance in Sm-Nd and Rb-Sr analysis by Tuula Hokkanen and Arto Pulkkinen is acknowledged. Riitta Kontio is thanked for preparing chromite separates. Brain O’Driscoll and Alexandra Yang Yang are thanked for constructive reviews and Bernd Lehmann for editorial handling of the manuscript. This work was funded by the projects of Academy of Finland (No. 276614, 281859) and the K.H. Renlund Foundation.